Do you love dancing, tapping your feet and snapping selfies at Levitt concerts? 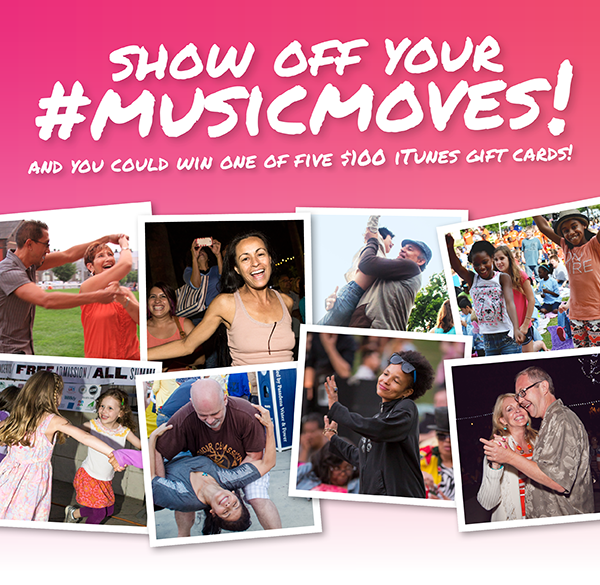 Show us how #musicmoves you and you could win one of five $100 iTunes gift cards! a pic of you, your friends, family, pets, neighbors or the artists having fun at a Levitt concert! your photo on Twitter or Instagram using #musicmoves in the caption. Make sure your profile is public! your photo and other submissions from all across the country on our live #musicmoves feed! Each month, from June to October, we’ll be choosing one lucky winner with a creative photo and caption to receive a $100 iTunes gift card! Check out our #musicmoves feed for inspiration about all the fun ways to show how #musicmoves you! And be sure to visit our Facebook, Twitter and Instagram pages, where we’ll be featuring your #musicmoves posts throughout concert season, in addition to keeping you up to date on the latest concert info! This entry was posted in Concerts, Levitt in America and tagged #musicmoves on June 5, 2015 by Nicole McGaffey.